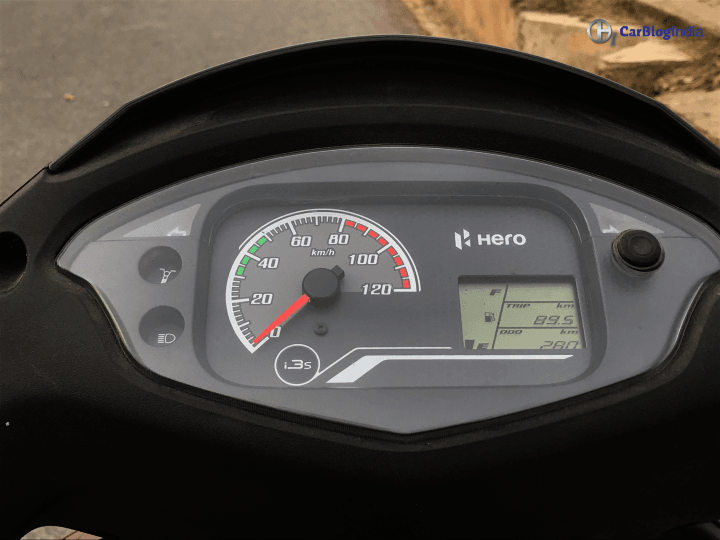 Hero made an entry in the 125cc scooter segment with the new Destini 125. Its other scooters in the lineup are all sub-110cc scooters, including, Pleasure, Maestro and Duet. Hero Destini 125 carries Hero’s USP for all of its models, by delivering a good average for a 125cc scooter. That said, it also gets a decent feature list to go along. The scooter is targeted mainly towards family buyers, as officially said by Hero. Most of the points ahead are said, considering its targeted buyers. 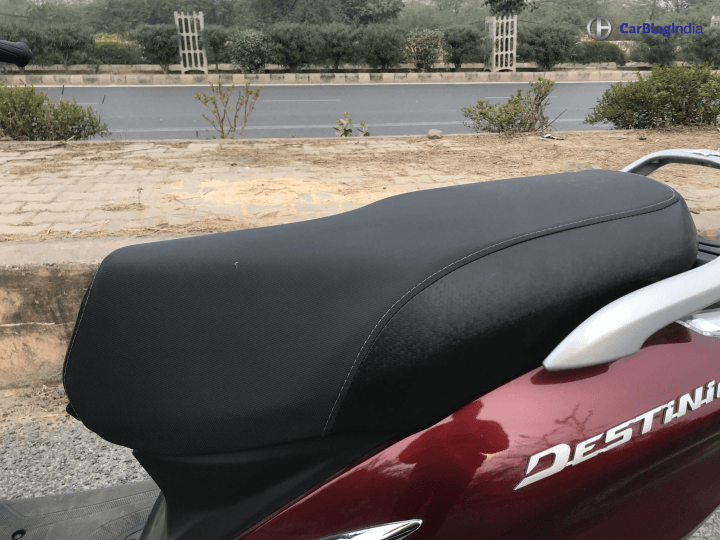 So, CarBlogIndia got to review Hero Destini 125 for a couple of days of daily commuting. Check out the Pros and Cons of the scooter ahead. 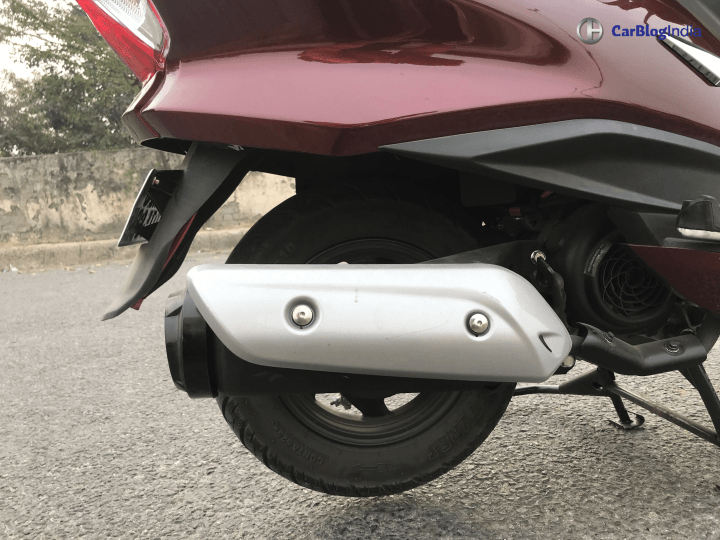 Hero Destini 125 is a 125cc scooter targeted for family buyers. The engine has been tuned for pure mileage purposes and not for performance. That’s what most of the family buyers look for, Comfort and Mileage. 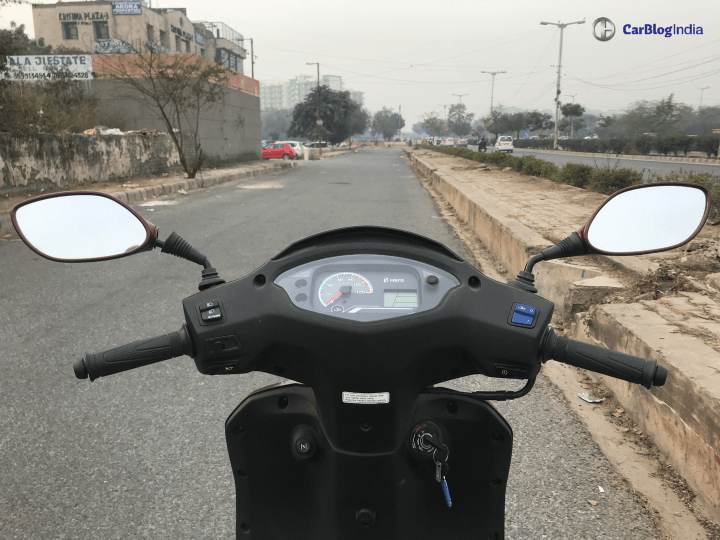 During our road test, the scooter delivered a good mileage figure of 51 kmpl. The scooter was not ridden aggressively, because of which the mileage was maintained. Over the highways, it went up by 1-2 kmpl. In the city, the figure remained at 49 kmpl. Impressive. Also, Hero’s trademark i3S technology came into use here. 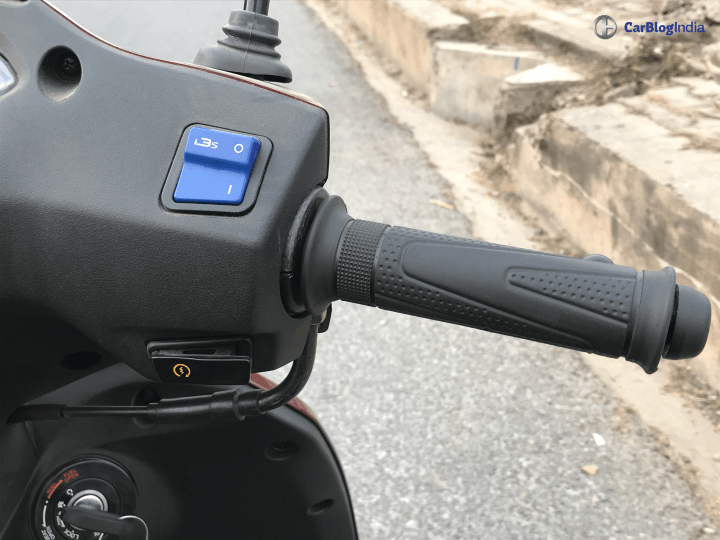 The idle start-stop system switches off the engine if the scooter is idle for more than 5 seconds. Once you press the brake and rev up, the engine resumes smoothly. This system does not save a whole lot of your fuel but affects the mileage to a certain point. However, in heavy traffic, it sometimes gets irritating. You know, switch off-switch on again and again. Destini 125 is styled very conservatively. There are some styling bits, but that’s it. Its not loud and funky, but is simple yet classy. The chrome bits on the side and front fascia look good on the scooter. The Maroon-Black combination is pretty good for my liking. It is not the usual colour that you want, but it completely matches here. A simple design might actually be a plus point for the family buyers. Buyers of an older age group, might like it clean and sophisticated. Simple styling compiled with good mileage works out great for their daily commuting. This point comes in both Pros and Cons as well. 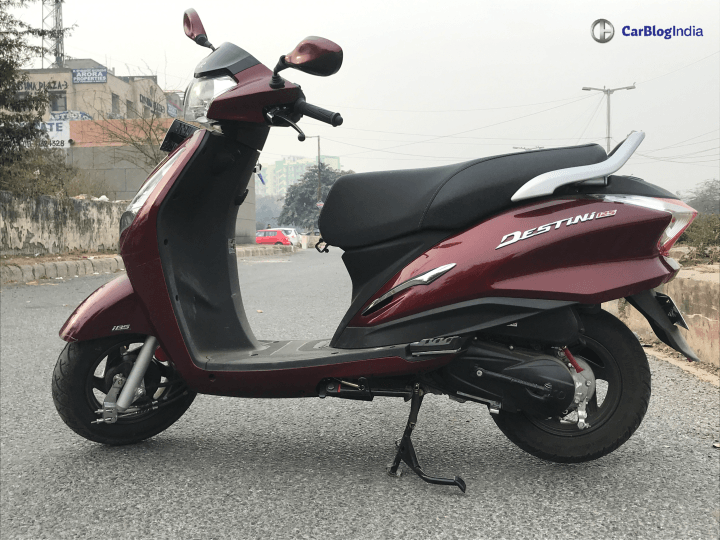 In terms of features, Hero Destini 125 is somewhat hanging in between. It has some good features but misses out on some desired ones as well. Destini 125 is equipped with a digital-analogue instrument cluster, with a side stand indicator. It gets Combi-lock system, which enables you to open the boot as well as fuel cap from the same point. Also, it gets an external fuel filler cap, making it a whole lot easy. Inside the boot, it gets a luggage lamp and USB charger. Additionally, it also gets the trademark Hero i3S system, which is the first in any scooter. 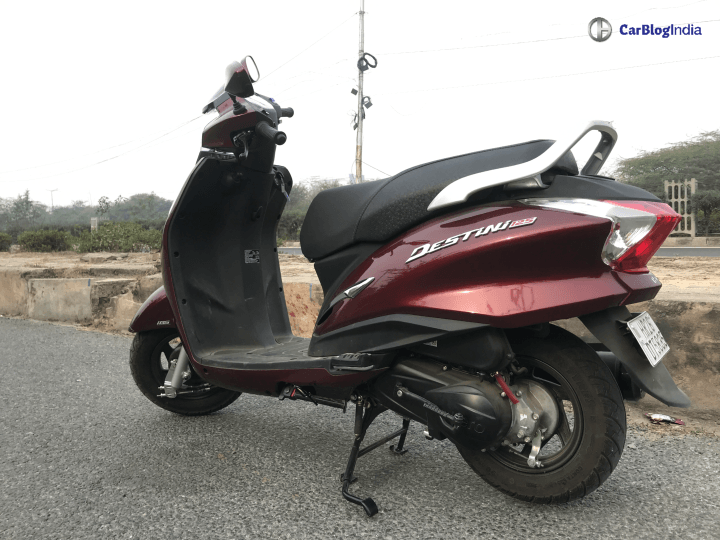 Hero Destini 125 weighs 111 kgs, which it actually does not feel like. Many scooters in its competiton are lighter than Destini. Its balanced handling characteristics are helpful for female riders and elderly riders as well. It is easy to manoeuvre and zip-zap through the traffic. Also, pulling it out from your parking spot is not tough with this scooter. However, being a lightweight scooter has its own disadvantages. We have mentioned that point further. Comfort is another highlight of the scooter that family buyers look for. 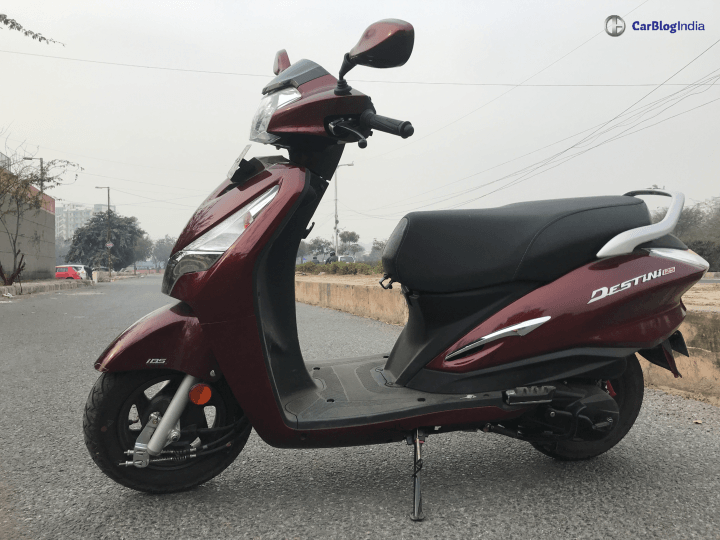 Not to worry, but Hero Destini 125 offers a very comfortable ride. For my office commute of 80 kms, my bottoms did not hurt. The seat is quite soft and comfortable, even for the pillion. Also, the seat is big enough to accomodate two healthy adults. Talking about the suspension, it gets telescopic forks at the front and coil spring hydraulic at the back. Hero has tuned the suspension to a softer side, which gave very less jerks. Riding over damaged roads wasn’t completely taken care of, but was above average. It would easily soak regular potholes but was affected by larger ones. No scooter or bike could actually move like a breeze over chunk potholes..
Its last Pro is its pricing. Hero Destini 125 is available in two variants, priced at Rs 54,650 and Rs 57,500 (ex-showroom). 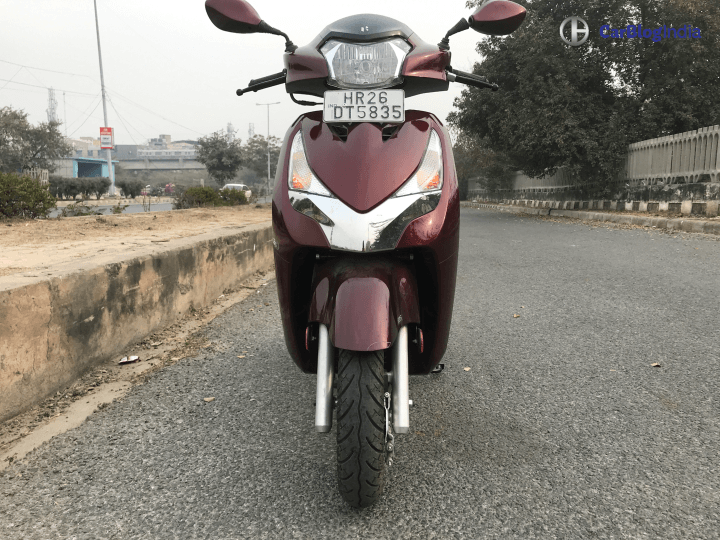 It is currently one of the cheapest 125cc scooter in the market. It is actually cheaper than some 110cc scooters as well. With these pros, it more or less completes its aim to satisfy the family buyers. Here are some cons of the scooter. As said earlier, Destini 125 has balanced and is actually light weight. This has its own disadvantage. At higher speeds, the scooter wobbles a lot. In regard of this scooter, higher speeds mean going over 70 km/hr. Till that speed, the scooter cruises perfectly, no complaints. Cross its cruising speed and it tends to wobble. Many times, it was left shaken up when a car passed by at high speed. Here is its biggest disadvantage. It comes without an option of a disc brake. At the launch, we asked the reason, to which Hero Motocorp replied that CBS gives enough bite to the scooter. Usually, the competitors in this price range offer one disk brake as an option. However, we tested the brakes from 60-0 km/hr and then bite was actually good. The braking was progressive and decent enough in times of emergency. Even its braking distance was lesser than what we expected. Hero Motocorp has designed Destini’s engine is such a way that it delivers linear power. There is no rush and it takes off from standstill at its own speed. The linear power delivery has been given keeping its mileage in mind. However, in case of sudden acceleration, there is no instant power felt. It takes time to reach the desired speed, even if the throttle is completly open. For some, this might be a Pro, but being a part of the younger generation, I consider it to be a let-down. A lot of scooters these days usually have LED pilot lamps or DRLs or fully LED headlamps. Destini fails to offer either of these. It uses a regular Multi-Reflector lamp at the front and a similar kind at the back. This particular disadvantage has been added in the list because most of its segment players offer one. Scooters from Honda and TVS either offer LED headlamps or LED pilot lamps. Yamaha scooters offer Halogen bulbs. Suzuki Access 125 also does not offer one, but Burgman Street offers full LED headlamps. 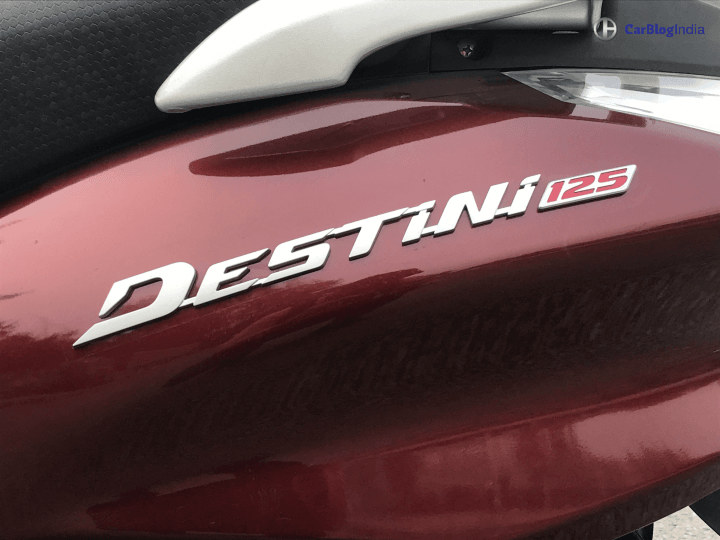 So, these were the Pros and Cons of Hero Destini 125. As you see, there are more plus points for the scooters. 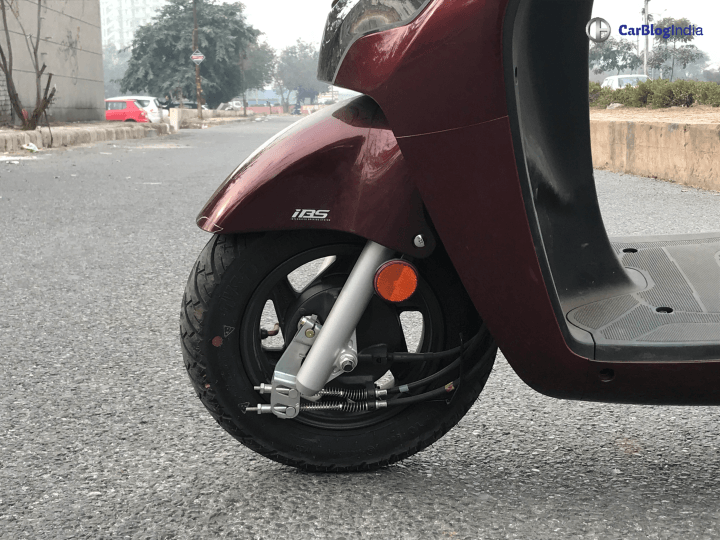 If you are looking for a simple scooter but with more power under the budget of Rs 60,000, you can definitely look this up!